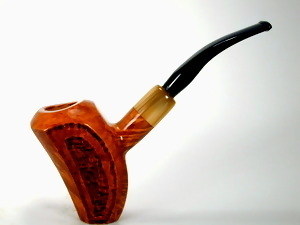 Ballerina - smooth on one side artisically rusticated on the other. Contrasting ferrule and stem. L = 6.25 in. /15.9cm. Dia. = 0.75 in. / 2.0 cm. H = 3.0 in. / 7.7 cm. Depth = 1.75 in. / 4.4 cm. W = 1.75 in./ 4.4 cm. Weight = 3.0 oz. / 85g. Enter a name like "Dad" or "Bob". We'll ask for shipping info at checkout.